You can tell a lot about friends by how they praise one another — and how they tease. “He’s more scared of mosquitos than most people would be of elephants!” said Harry Steele with a laugh, explaining why it was that Seymour Schulich, seated in front of him, hadn’t made it to more of his famed fly fishing camps. The camps — excursions to Labrador which have attracted the likes of premiers, prime ministers and even U.S. presidents over the years — aren’t the only place where the two business leaders have crossed paths, but they were an important part in cementing a friendship that has lasted decades. “There’s no better way to learn about people than spending three days trapped at a fishing camp with them,” said Schulich. Along those lines, it seems only fitting that at the ceremony to announce that Dalhousie’s state-of-the-art Ocean Sciences Building will wear the Steele name, the two moguls seemed far more interested in talking about each other than themselves. “The fascinating thing about Harry was how he could bond with people in a short period of time,” said Schulich. “He probably never read Dale Carneige, and yet he used all the techniques in the book How to Win Friends and Influence People. The partnership and friendship that inspired the naming of Dal’s newest research facility dates back more than 50 years. The two met around the time that Steele, who grew up in a Newfoundland fishing village called Musgrave Harbour, retired from a 24-year career in the Navy. Steele became a vice-president at Eastern Provincial Airways and, after buying a majority share in the company, brought in Schulich as the company’s chairman. As their careers advanced — Steele with the Newfoundland Capitial Corporation (a holding company, now known as NewCap, with interests in everything from broadcasting to hotels), Schulich with Beutel, Goodman & Company Ltd. — they always made time to connect with one another, whether it was business or just for fun. Dal represents another bond between them. Schulich has been a major benefactor to the university: a scholarship fund in Computer Science, a $20 million donation to the law school that now bears his name, and just this year he was instrumental in an agreement between Dal and Ben-Gurion University to establish a new ocean studies centre in Eilat, Israel. Steele has been a key advisor to the university in several areas, sitting as an advisory board member for the Faculty of Management and serving on the board of the Dalhousie Medical Research Foundation. Shortly after the Ocean Sciences Building was opened a year ago, the two had the opportunity to tour the new facility together. “We met the researchers, and viewed the facilities, and we had a great time,” said Steele. “I must say: I was mightily impressed. 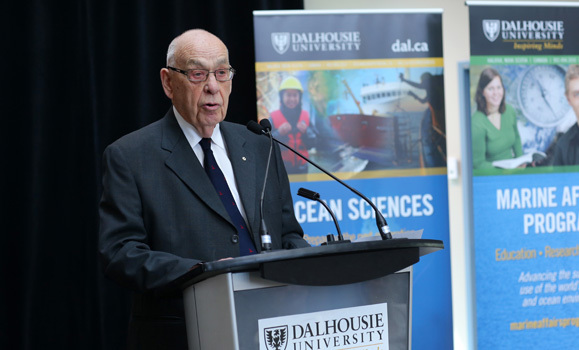 This province has a long association with the ocean, and I can’t think of anything for fitting for Dalhousie than to be exploring ocean research. “Since this tour, Seymour and I have had many conversations about the important work being done here at Dalhousie, and how to help make the work world-class is one of the major concerns," said Steele (pictured above). 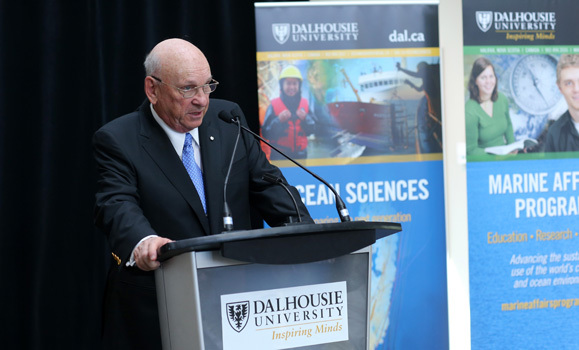 The two share a commitment to helping expand the reach and impact of Dal’s oceans research. Speaking on behalf of the university, President Richard Florizone expressed his gratitude for their support. 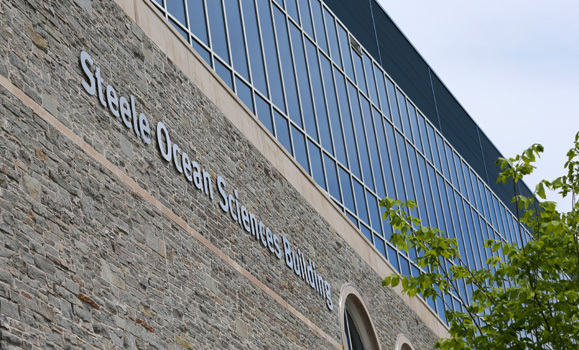 The Steele Ocean Sciences Building is a one-of-a-kind space that clusters oceans experts and innovators under one roof. Inside the four-storey, 76,000-square-foot building — which attracted more than 1,500 visitors during Doors Open Halifax this past weekend — you’ll find Dal’s unique Aquatron research facility, as well the CERC Ocean (Canada Excellence Research Chair) research team. It hosts major research networks including the Ocean Tracking Network and MEOPAR (Marine Environmental Observation Prediction and Response Network). And it’s also home to the Institute for Ocean Research Enterprise (formerly the Halifax Marine Research Institute) and Dal’s Marine Affairs Program. Speaking about the building, Dr. Florizone explained that universities exist to bring together the best minds and knowledge from around the world, but can also be a meeting place to come together with industry and government to tackle tough challenges. And now, that building has its official name, and it’s one with a lot of history and support behind it. 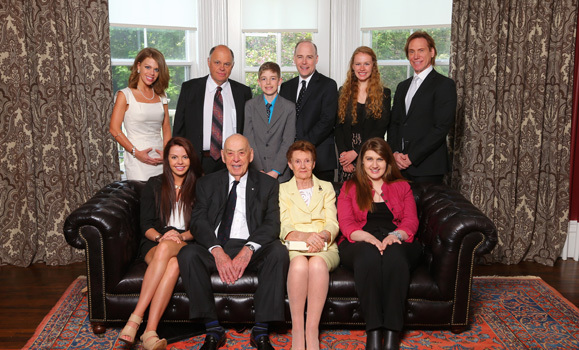 “This is a commemoration of the family’s contributions to life around here,” said Schulich (pictured above), noting that the building’s name recognizes not just Harry’s accomplishments but those of the entire Steele clan. “There’s nobody who can do more for me than Seymour’s done,” said Steele, expressing his gratitude for their friendship. “It’s been great fun. We’ve excited a lot of people; we’ve annoyed a few too,” he added, with a laugh. Steele was visibly moved to be able to share the moment not just with his old friend and members of the Dal community, but with his wife Catherine, his children and his grandchildren, all five of whom were there for the celebration. The Steele family, following the ceremony.